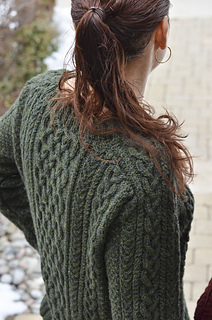 Ravelry: Shire Aran pattern by Glenna C.
Shire Aran by Glenna C.
Whether you’re dreaming about moving into a cozy Hobbit-hole in the Shire (and let’s face it, who wouldn’t want to?) 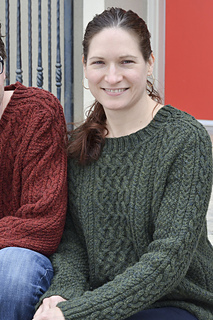 or simply indulging in the classic knitter’s cabled pullover for warm wear in the cooler months, the Shire Aran sweater is for you. 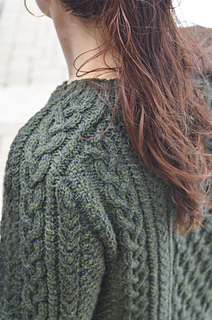 Refresh your cabled knitting skills, grab some wonderful wooly worsted weight yarn, and get knitting - this sweater will be a comfortable, classic layering piece in your wardrobe for many years to come. 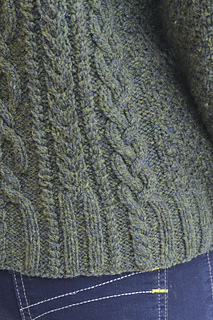 This is a saddle-shoulder pullover worked in pieces, featuring cable panels that combine organic twists and turns with the stability of vertical lines. 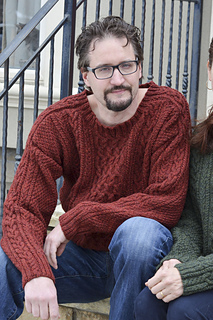 Intended for looser ‘positive ease’ wear, this pattern uses a classic ‘sheepy’ wool, Harrisville Designs Highland. 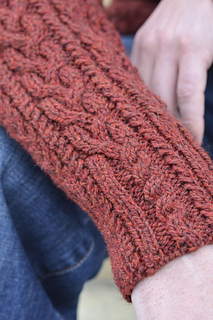 Knitters substituting yarn should look for a similar woolen yarn, or a less rustic wool if choosing a fit that is closer to the body. 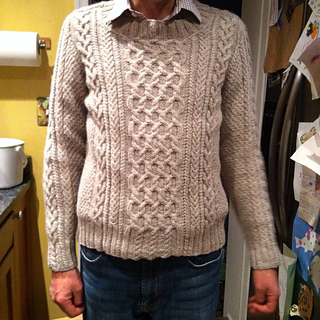 This is a saddle-shoulder pullover worked from the bottom up in pieces. Pieces are sewn together before working the collar to finish. 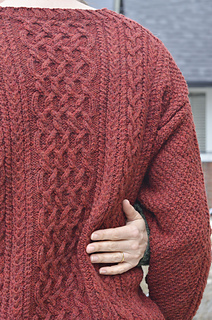 Men’s version is a drop-shoulder pullover, women’s version is a set-in sleeve pullover with sloped shoulder shaping, and both are worked straight from the hem to the arms (no waist shaping). 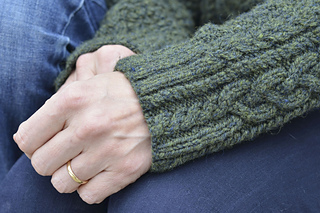 It is strongly recommended that the knitter is comfortable working both cable knitting and sweater knitting, before beginning this project. Working cables from charts will also be required. Cables charts are NOT included in written format.